With the world-famous Tsukiji fish market moving from Tsukiji to Toyosu in October 2018, Tokyo’s Tsukiji area is undergoing major changes. After 83 years of Tsukiji being synonymous with Tokyo’s fish market, a glorious chapter in Tsukiji’s history has ended. But every ending has a new beginning. 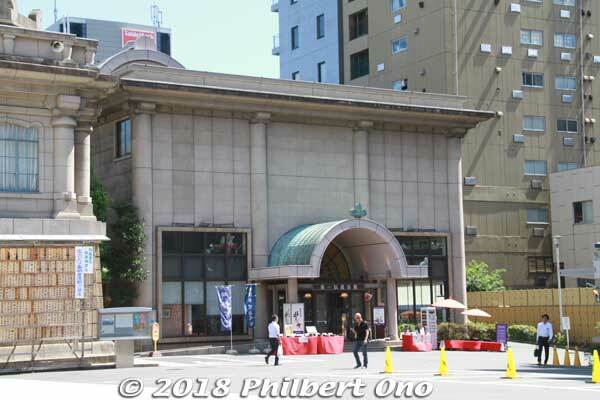 The former fish market’s popular Outer Market with sushi restaurants and shops has been enhanced and will stay put to continue the Tsukiji brand. Also spreading its wings in Tsukiji is the venerable Tsukiji Hongwanji Buddhist Temple (築地本願寺), almost next door to the Outer Market. Tsukiji Hongwanji is the Tokyo headquarters temple of the Jodo Shinshu Pure Land sect (Hongwanji School 浄土真宗 本願寺派), Japan’s largest Buddhist sect with over 10,000 temples in Japan and over 7 million adherents. 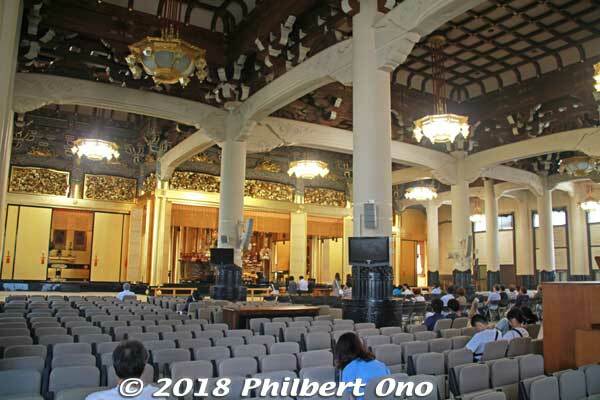 It is also the largest traditional Japanese Buddhist sect outside Japan with about 200 temples and groups overseas, mainly in Hawaii (30+) and North and South America (100+). The mother temple is Nishi Hongwanji (World Heritage Site) in Kyoto. 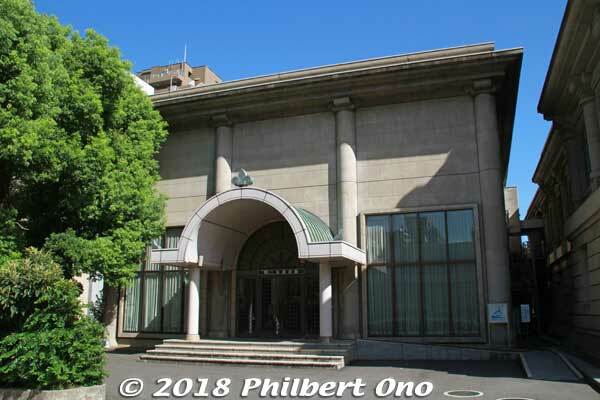 Tsukiji Hongwanji employs about 70 priests headed by Ohtani Kojun (大谷光淳 1977– ) who is also the sect’s 25th head priest (Monshu 門主) and descendant of sect founder Shinran (親鸞 1173–1263). Barrel vault roof shaped like a Bodhi tree leaf. 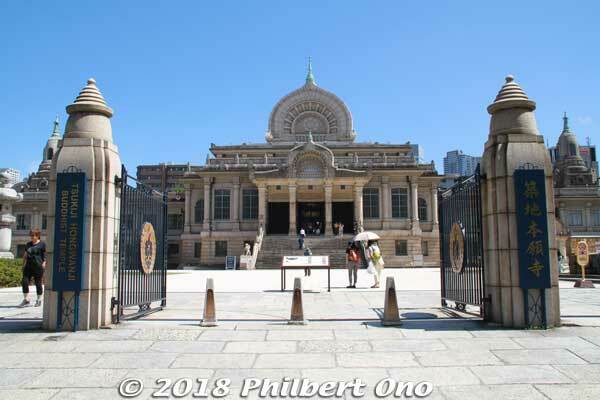 Enter Tsukiji Hongwanji’s front gate and behold an imposing Indian-style building unlike any other Buddhist temple in Japan. 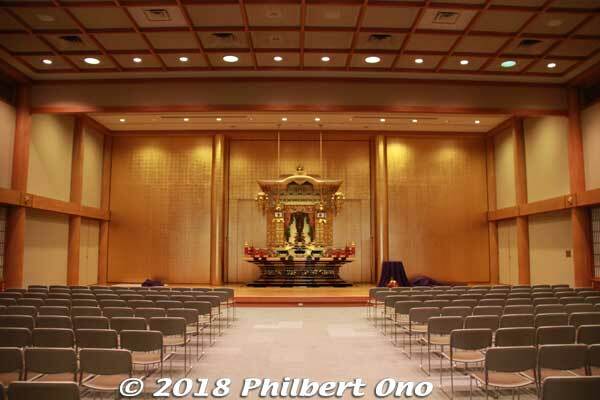 This is the main worship hall (Hondo) with the center roof having a barrel vault, shaped like a Bodhi tree leaf containing a lotus flower design. The design is similar to the Ajanta Buddhist Caves (Cave 9) in India. It is complemented by stupas on the left and right ends of the building. 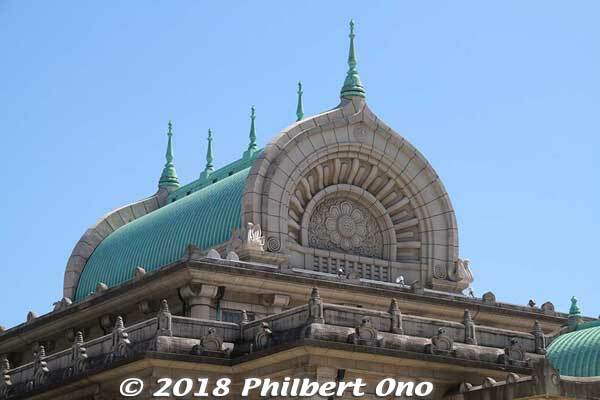 Built in 1934 in ferroconcrete, the Hondo was designed by Ito Chuta (伊東 忠太 1867–1954), a renown architect who also designed Meiji Shrine, Yushima Seido, Heian Shrine, Haiseiden, and many other buildings. He had studied architecture in India, China, and Turkey. Tsukiji Hongwanji is one of his greatest masterpieces blending Indian, Western, Islamic, and Japanese design elements. He included many interesting little features like winged lions, animal sculptures, stained glass, and Islamic arches. Go up the center steps to enter the main temple hall. 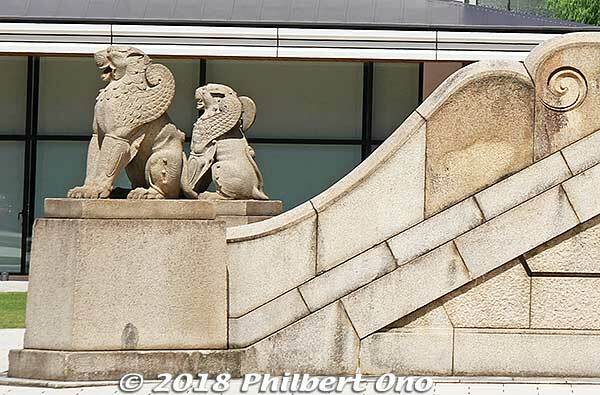 Winged lions at the bottom of the steps. 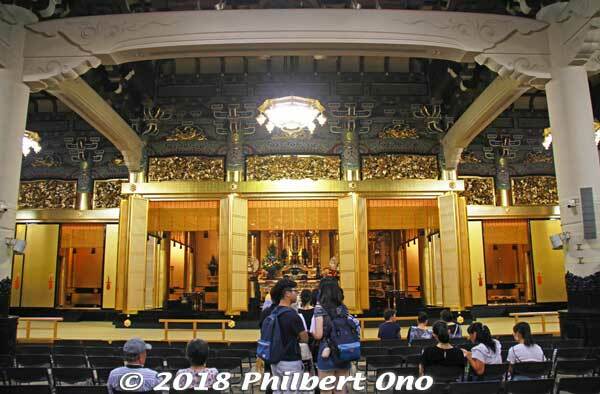 The original temple was first built in 1617 near Higashi Nihonbashi and called “Edo Asakusa Mido.” It was destroyed by the Great Meireki Fire in 1657, then relocated and rebuilt on reclaimed land aptly named “Tsukiji” (“built-up land”) in 1679. Called “Tsukiji Gobo” (築地御坊), it was a Japanese-style temple that faced what is now the Outer Market. The Outer Market area was originally a temple town with many secondary temples. Tsukiji Gobo was consumed by fire in 1923 caused by the Great Kanto Earthquake. 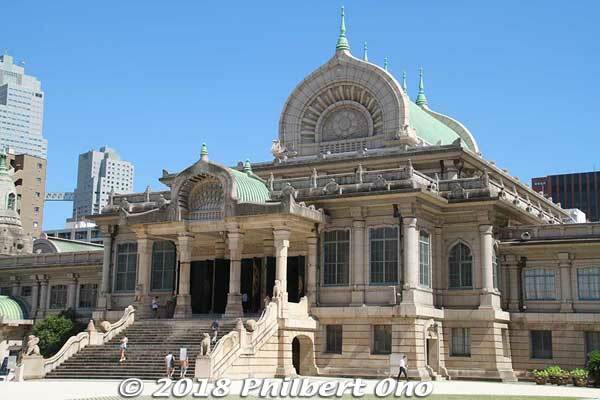 The temple was then totally redesigned and rebuilt in 1934 facing the direction it faces today, away from the Outer Market area where only three temples remain today. Tsukiji Hongwanji and the Outer Market have had a long joint history. During World War II in March 1945, the Hondo luckily missed being firebombed. The Indian-style temple has thus survived to this day. 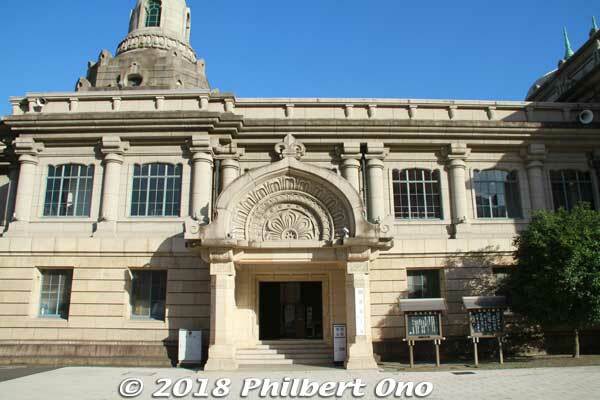 In 2012, the temple’s official name was changed from “Hongwanji Tsukiji Betsuin” to “Tsukiji Hongwanji.” In practice though, people have always referred to it as “Tsukiji Hongwanji.” The nickname is now the official name. It has retained the archaic English spelling of “Hongwanji” (vs. “Honganji”) as part of its official name in English as do the sect’s temples in Hawaii. 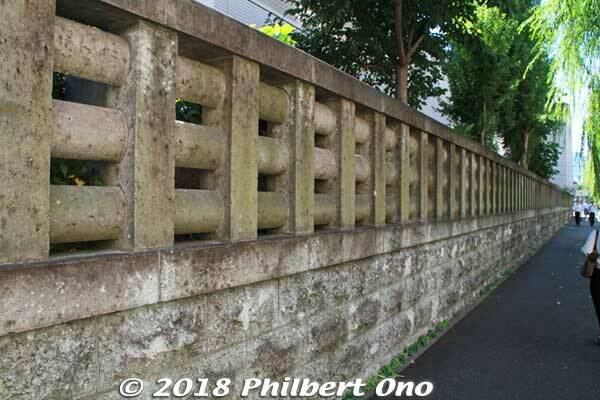 In 2014, the Hondo, temple gate pillars, and perimeter stone walls were designated as National Important Cultural Properties. 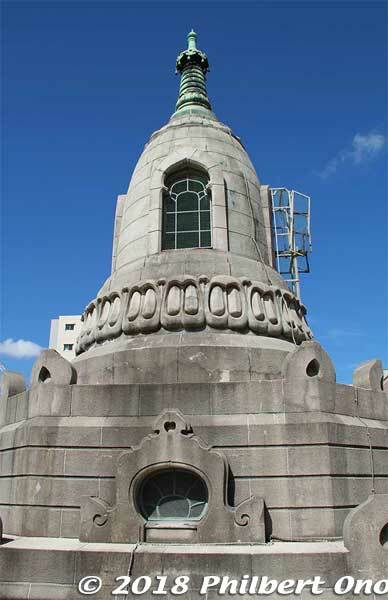 To enter the Hondo, pass the winged lions and go up the center steps to the second floor. The interior is impressive with an ornate ceiling, a large golden altar area, and a huge pipe organ in the back. Instead of tatami mats, there are 550 chairs. No need to take off your shoes. The interior blends Japanese, Jodo Shinshu, Indian, and Western design. Anyone can enter the Hondo for free (open daily 6:00 a.m.–5:00 p.m.). An English brochure is also available. 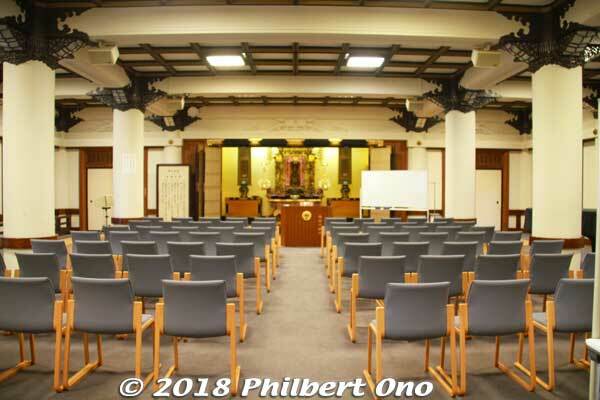 Altar inside Tsukiji Hongwanji’s air-conditioned Hondo main worship hall. Hondo main worship hall’s maximum capacity is 1,000 including standing room. There are English instructions on how to pray and offer incense. A standing statue of Amida Buddha at the altar’s center. 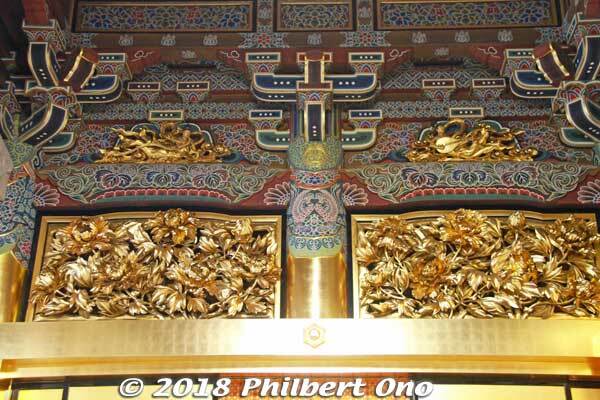 The large altar is gold to symbolize the Pure Land. The gold leaf was completely redone in 2012 for the first time since the temple was built. 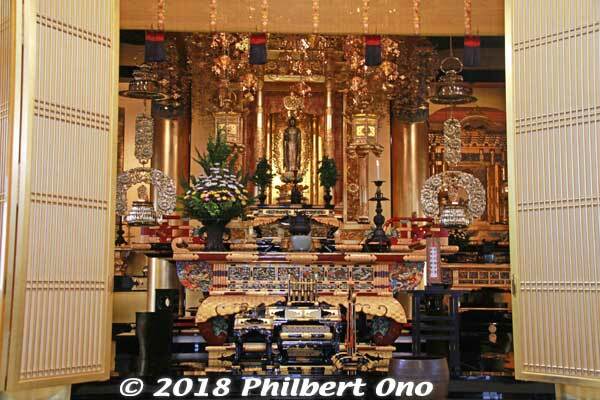 The principal object of reverence is a standing Amida Buddha statue in the center. On the left and right of the main altar are secondary altars and sub-chambers for other subjects of reverence. 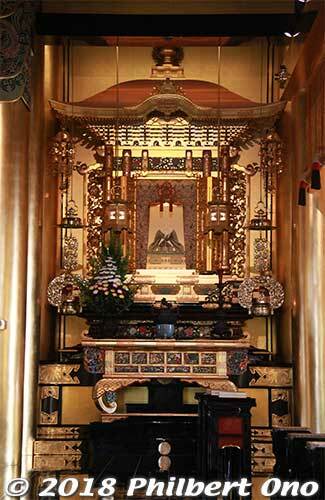 On the right are a secondary altar for sect founder Shinran and a sub-chamber for Prince Shotoku Taishi (574–622) who introduced Buddhism to Japan. 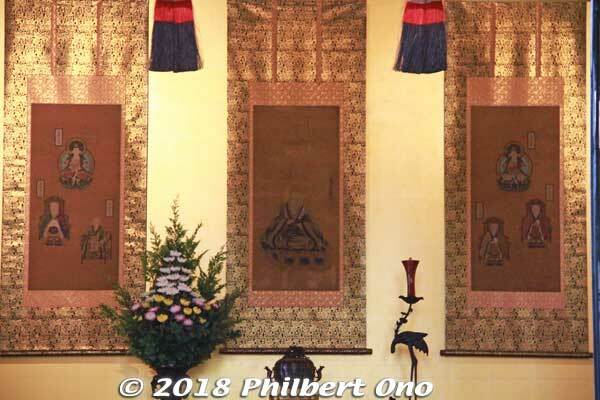 On the left is an altar with a scroll painting of Shonyo (勝如上人 1911–2002), the sect’s 23rd Monshu (during 1927–1977) and former head priest of Tsukiji Hongwanji who widely spread the teachings even overseas. 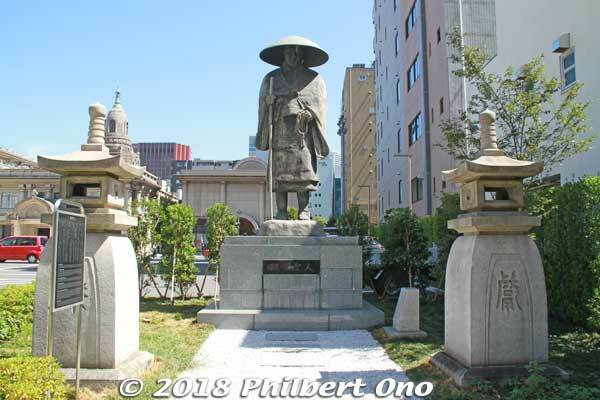 His real name was Kosho Otani (大谷光照), a cousin of the late Emperor Hirohito and the grandfather of the current Monshu. 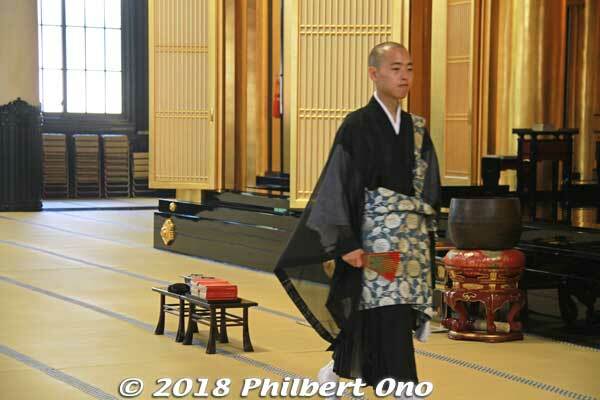 The left sub-chamber has the Seven Jodo Shinshu Patriarchs (scroll paintings) named by Shinran as the key Buddhist monks in India, China, and Japan who helped develop the Jodo Shinshu religion. 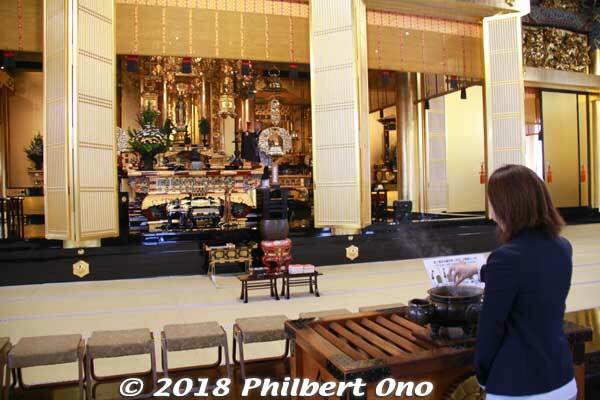 It is typical for temples of this sect to have secondary altars for Shinran, Shotoku Taishi, and the Seven Jodo Shinshu Patriarchs. Shinran on the immediate right of the main altar. Seven Jodo Shinshu Patriarchs in Tsukiji Hongwanji. You can see priests chanting in front of the altar daily at 7:00 a.m. (45 min.) and 4:30 p.m. (15 min.). 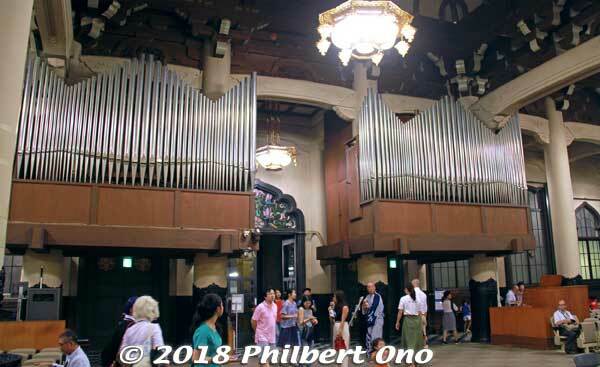 Tsukiji Hongwanji’s pipe organ pipes. The organ is on the lower right in the photo. The back of the Hondo has the huge pipe organ with 2,000 pipes. It was donated by the Bukkyo Dendo Kyokai Buddhist propagation society and installed in 1970. 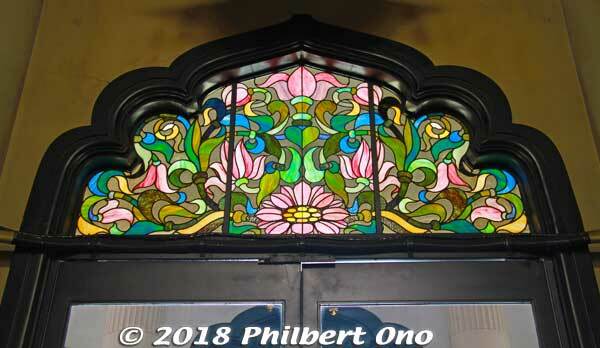 Played for weddings, services, and lunchtime concerts on the last Friday of the month at 12:20 p.m.–12:50 p.m.
Lotus flower stained glass above the Hondo’s front door. 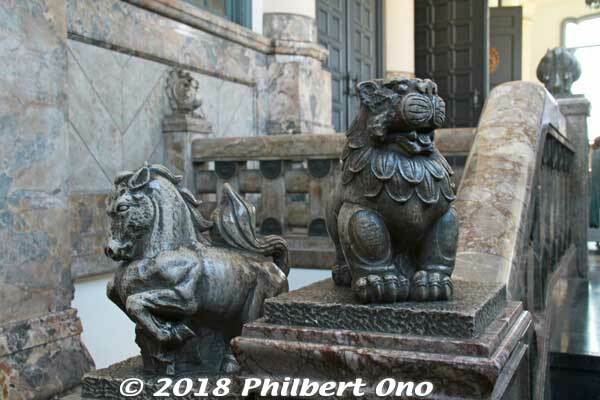 Marble statues of Buddhist-related animals along the stairway to the Hondo’s 1st floor. 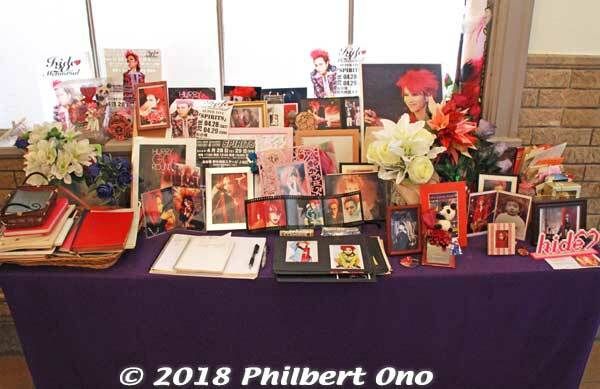 Memorial table for hide (X Japan) on the 1st floor lobby of the Hondo. Another must-see “altar” is the memorial table for hide (pronounced “hee-day”), the legendary guitarist for the heavy metal band X Japan who died at age 33. Ever since his funeral was held at Tsukiji Hongwanji in May 1998 (attended by 50,000), fans have been paying tribute here by leaving memorabilia, letters, photos, and notebooks filled with handwritten messages even in English by foreigners. Perhaps this is the only major temple in Japan to have something like this for a rock star. On the left of the Hondo, entrance to Mombo Hall. On the left of the main temple hall is Mombo Hall (聞法ホール), a small worship hall. This is where the English Service and fellowship is held on the last Saturday of the month at 5:30 p.m.–7:30 p.m. Check their web page for the exact schedule and guest sermon. In 2017 for its 400th anniversary, Tsukiji Hongwanji started a new outreach project (“Tera to Project” 「寺と」プロジェクト) to make itself more integral, relevant, and helpful in the community. Indeed, their summer bon dance celebration is now a huge outdoor food fest attracting 80,000 over four evenings. People fill the chairs and tables spread over almost the entire area in front of the temple. Lots of people dance around the yagura tower too. The food booths are popular and a few are run by eateries from the Tsukiji Outer Market. 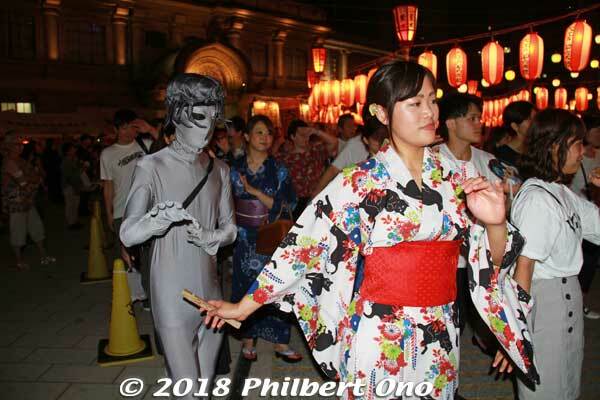 Tsujiki Hongwanji bon dance in early Aug. 2018. Costume Night at Tsukiji Hongwanji bon dance. Also watch the hilarious video below. A major part of this outreach project is the Information Center that opened in November 2017 left of the Hondo. It houses mainly Cafe Tsumugi (open every day 8:00 a.m.–9:00 p.m.) along with a multilingual information desk, temple gift shop, lecture room, and bookshop (2nd floor). 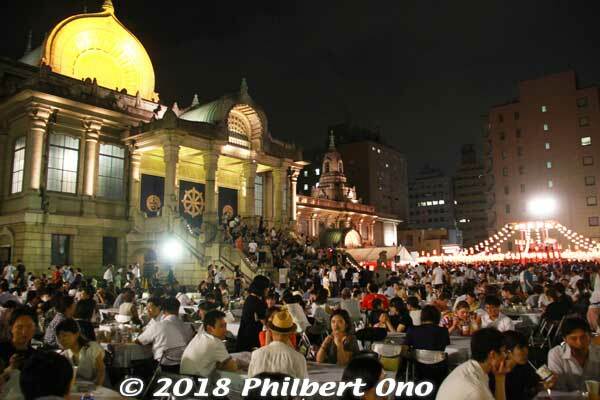 During the bon dance, the rooftop is open for diners like a beer garden. Information Center opened in Nov. 2017. 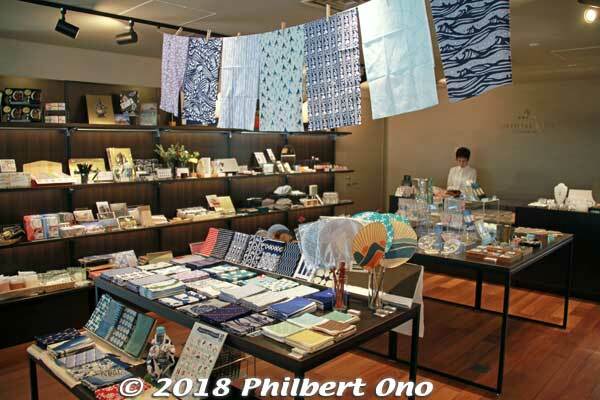 Inside the Information Center, Cafe Tsumugi (open 8:00 a.m.–9:00 p.m.) . Cafe Tsumugi’s Japanese Breakfast with 18 Dishes (18品の朝ごはん). Operated by the Pronto coffee shop chain, Cafe Tsumugi has an extensive menu for meals (Japanese and Western cuisine), drinks (including alcohol), and confections. They even have power outlets for laptops, tablets, etc. 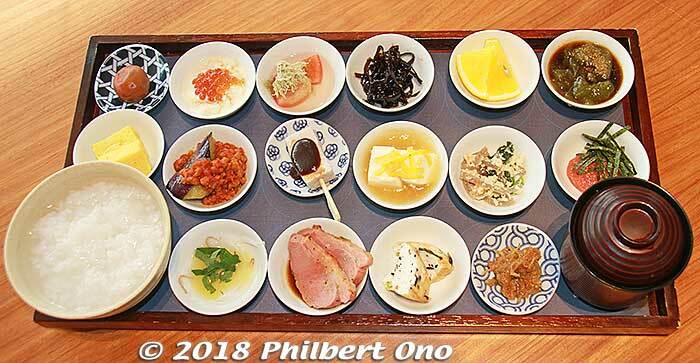 For breakfast served 8:00 a.m.–10:30 a.m., I had to try their “Japanese Breakfast with 18 Dishes” (18品の朝ごはん). The picture on the menu makes it irresistible. A colorful assortment of 18 dishes including rice porridge, miso soup, and flavorful bite-size dishes like salmon roe, eggplant, tofu, duck, and matcha jelly dessert. A few of the dishes like the fried egg and fish cake were made by famous eateries at the Outer Market. The number “18” refers to the 18th and primal vow (hongan) of Amida Buddha. Hot or cold tea is included. Definitely social media material. 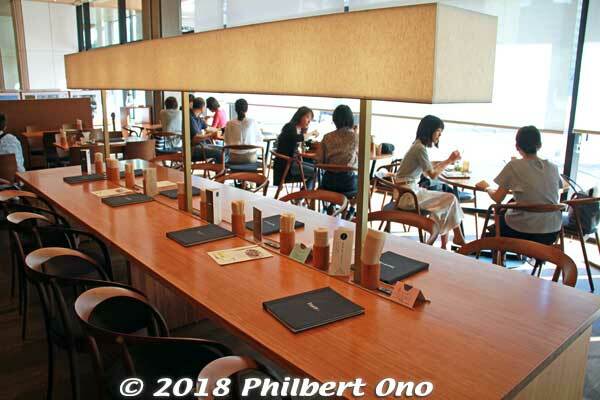 Note that Cafe Tsumugi has become very popular for breakfast (8:00 a.m.–10:30 a.m.). They now distribute reservation tickets (seiriken) to the first 110 people in line for breakfast. It’s less crowded for lunch and dinner when no reservation tickets are required. Temple gift shop inside the Information Center. 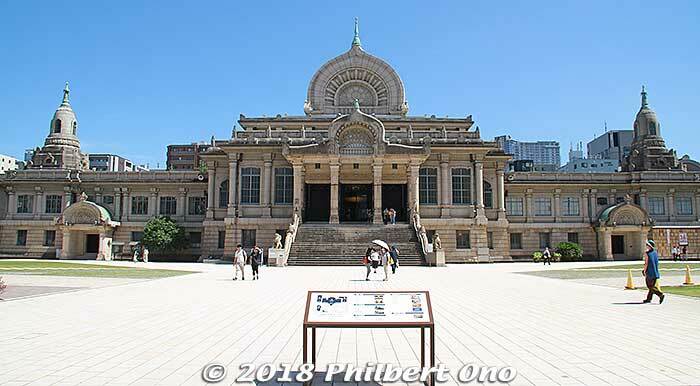 Tsukiji Hongwanji has other notable buildings, facilities, monuments, and even graves. The Hondo building has a modern building on both the right and left ends. 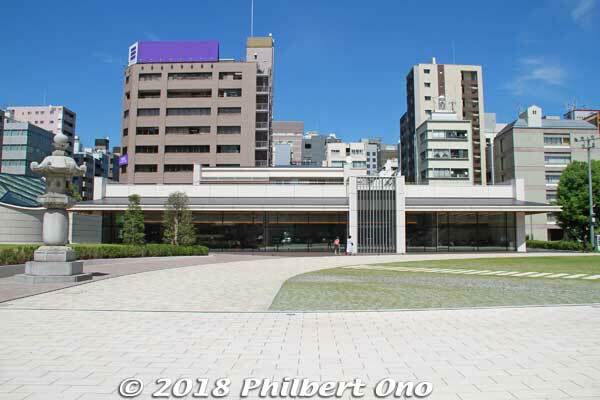 The building on the right end is the Daiichi Dendo Kaikan (第一伝道会館) open to the public. It houses a tea lounge, restaurant, meeting rooms, and temple lodging facilities (3rd floor). The left end has the Daini Dendo Kaikan (第二伝道会館) mainly housing the Rengeden worship hall (蓮華殿) for smaller funerals, weddings, etc., for up to 200 people. 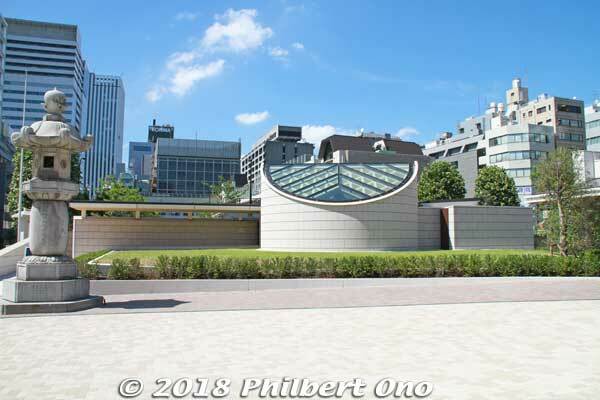 On the right end of the Hondo, the Daiichi Dendo Kaikan (第一伝道会館). Daini Dendo Kaikan (第二伝道会館) on the left end of the Hondo. Rengeden worship hall (蓮華殿) in Daini Dendo Kaikan. The left stupa houses the temple bell. 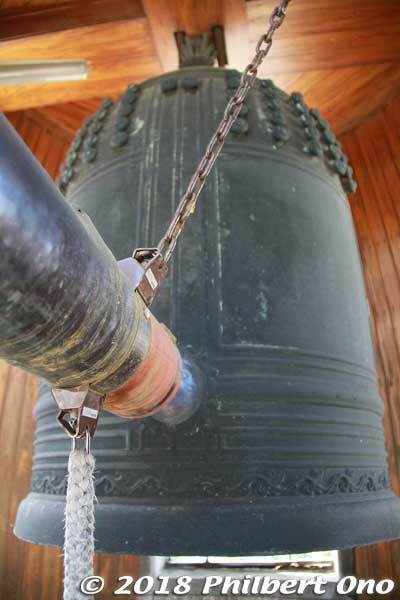 On New Year’s Eve, the public can enter the left stupa to ring out the old year or ring in the new year. The right stupa is currently not used for anything. Tsukiji Hongwanji’s left stupa houses the temple bell. Temple bell inside Tsukiji Hongwanji’s left stupa (not open to the public). 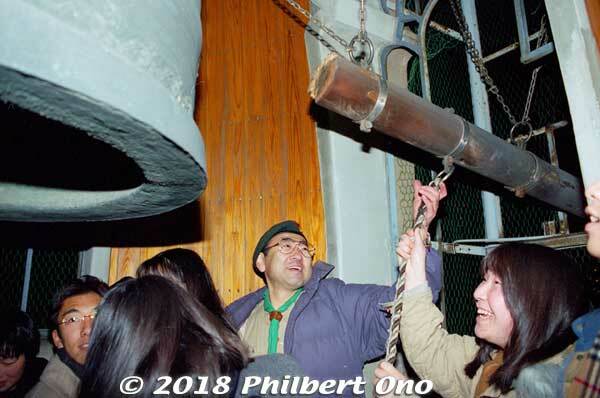 On New Year’s Eve at Tsukiji Hongwanji, the first 350 people can enter the left stupa and ring out the old year from 10:00 p.m. to 2:00 a.m. (Joya-e). 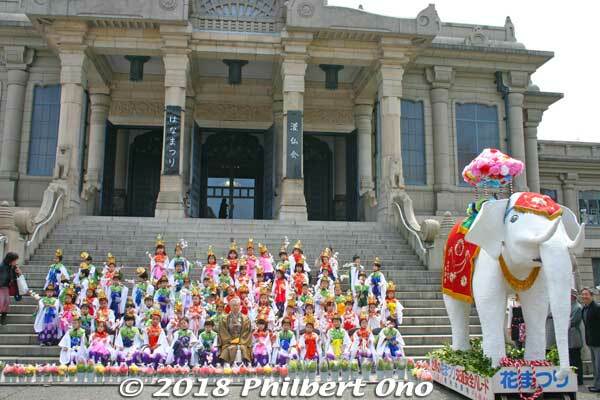 Hanamatsuri (Buddha’s birthday) on April 8 is another major event with a neighborhood parade led by a white elephant. 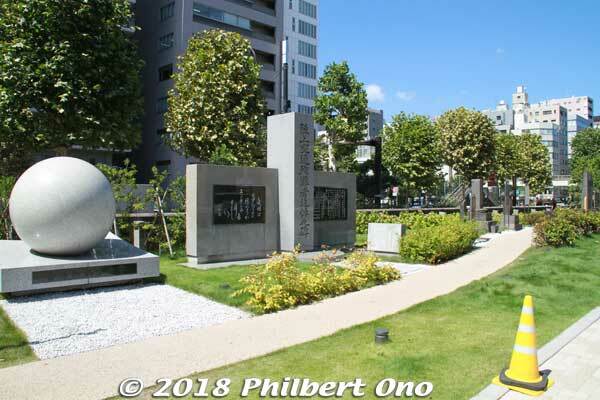 Next to the Information Center, the Goudoubo (合同墓) is like a communal gravesite opened in Nov. 2017. Compared to conventional cemeteries, it is a low-cost way to keep and maintain a grave for yourself and to assure that priests will keep praying for you. Goudoubo (合同墓) communal gravesite and worship hall. Temple gate pillars at the front gate (photo) and side gates are National Important Cultural Properties. Perimeter stone walls are National Important Cultural Properties. Statue of sect founder Saint Shinran, built in 1975. Monuments and graves along the front perimeter. English provided. With the fish market gone, Tsukiji Hongwanji and the Outer Market are destined to take the helm and continue working together for the betterment of Tsukiji and its visitors. I look forward to seeing how Tsukiji’s new era will unfold. Tsukiji Hongwanji is closest to subway stations Tsukiji (Hibiya Line), Higashi-Ginza (Asakusa Line), Tsukiji-shijo (Oedo Line), and Shintomicho (Yurakucho Line). *Special thanks to Tsukiji Hongwanji and Cafe Tsumugi for their kind cooperation for this article. *This article is an expanded version of my article published in via magazine, the onboard magazine of the Airport Limousine bus in the Tokyo area and lobby magazine at all branches of Mizuho Bank in Japan.